A wooden drawing board made from 5mm smooth MDF. Available in 3B, 6B and 9B 10mm and 15mm Grafcube graphite sticks have a high concentration of graphite and a unique shape that allows lines that are rough and thick, fine, or extra-fine. They come in 2 sizes and 3 degrees of hardness. Grafcubes can be used flat or across their entire length. Caran D'Ache Neocolor II watersoluble crayons are renowned around the world for their high pigment content, excellent lightfastness and ease with which they blend. These pastel pencils are presented in a sturdy foamlined box to prevent the leads from breaking. Made of ultra-fine artists' pigments, Caran d'Ache Pastel Pencils are drawing tools of the highesty quality. Fine dry blue pencil that's both soft and resistant, allowing you to create fine and broad strokes for basic sketching. Caran D'Ache Pastel Pencils available in 84 colours with high concentration fine pigment content. Each Daler Rowney Ingres Pastel spiral pad contains 4 sheets each of 6 colours: Blue Grey, Brown, Marble Grey, Olive Green, Sand and Stone Grey. The acid free paper is of 160g weight with a slight texture. Each page is interleaved with paper to prevent smudging of pastels. 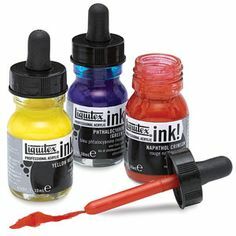 Daler-Rowney System 3 Acrylic Inks are a range of strong and vibrant water-based acrylic inks. Derwent Academy Sketching Pencil Tin selections of 12 or 6 pencils from 6B to 5H. Offers precision & speed in correcting small areas of work. The ultimate pencil storage solution for up to 132 pencils plus a range of drawing accessories and an A5 sketchbook. Blister of 4 contains: Light, Medium, Dark and Tinted Charcoal White. Derwent Coloursoft is an exciting range of coloured pencils. The soft, velvety strip allows you to quickly add lots of bold, vibrant colour to your drawing and they're great for colouring in! They're also blendable so you can create a variety of subtly different tones and shades. This tin of Derwent Soft Graphic Sketching Pencils is a perfect starting point for what every artist needs: a good set of traditional, high-quality graphite pencils. You can weave the most intricate designs with these cool fine liners. From sensitive line work and subtle blending, to expressive marks and deep tonal work, Derwent XL Graphite is smooth and refined. The Derwent Pencil Wrap has to be one of the simplest yet most useful accessories for anyone who enjoys drawing and sketching. Be inspired by pro artist & illustrator Iain McArthur. Take your fine lines on a journey from doodle discovery to exquisite fineline illustrations. The Derwent Inktense Paint Pan Travel Set contains the unique Inktense formulation found in our pencil and block ranges. The Derwent Inktense wash set contains everything needed to get started on your painting journey. All your line and wash sketching needs can be met with this artist quality set. 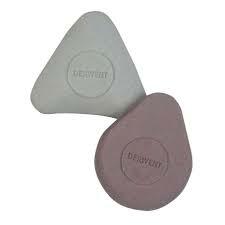 This Derwent Pastel Pencil Sharpener is specially designed for sharpening the more delicate pastel pencil lead. These wood cased Pastel Pencils have a soft, powdery texture which produces a velvety smooth finish, ideal for mixing and blending. Perfect for controlled erasing and correcting! Never get caught short again with these versatile packs of Derwent Pencil Extenders! Derwent Precision Mechanical Pencils have a premium full metal body, perfect for maintaining grip and balance whilst creating fine line drawings. A great tool to help with scale and proportion. Featuring a slim ergonomic shape, these firm erasers are easy to grip, for accurate erasing. The Derwent Sketching Wallet contains a selection of high-quality materials for sketching on the go. Extendable front plate/self feeding mechanism. Easy to use wash strengths for you; light, medium and dark. Made of synthetic rubber, this soft eraser is perfect for erasing unwanted graphite and pencil. Tape with a low adhesion which will not tear the paper surface when removed. Product only includes 1 38mm x 25m. Sets of double-ended waterbased felt-tip pens, for artists, designers and enthusiasts of all ages. Available in sets of 12 and 24 pens.